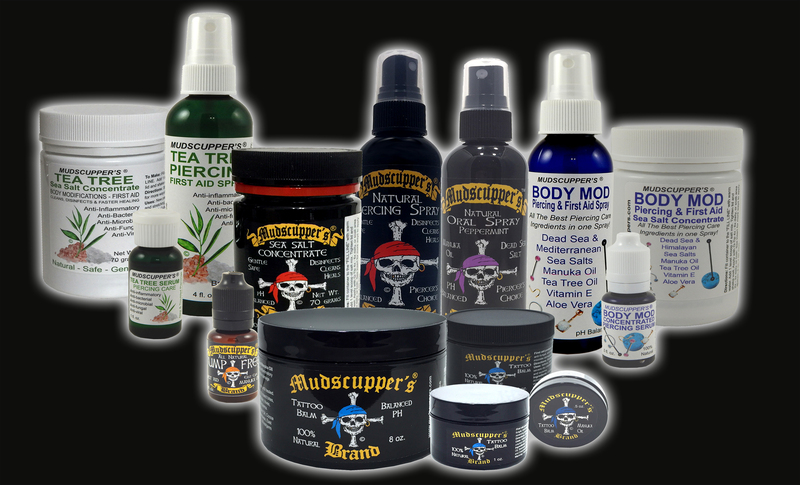 MUDSCUPPER'S TATTOO BALM & PIERCING AFTERCARE SPRAY - PROVIDES FIRST AID PROTECTION OTHER BRANDS DON'T! 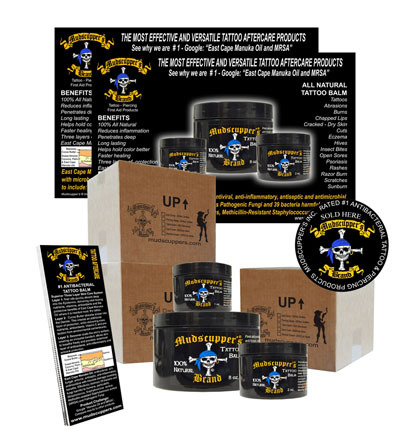 Why do thousands of people nationwide prefer Mudscupper's All Natural Tattoo Balm and Natural Piercing products over other brands? Simple: Other tattoo balms may moisturize and other piercing sprays may cleanse, but that's where it ends. Body Art Professionals and customers a like want first aid products that actually promote faster healing and help prevent serious infection. That's exactly what our products do. We formulate the ingredients necessary to ensure our customers receive the absolute best in protection for their tattoos and piercings. Other brands may contain some antibacterial properties, however, not enough to get the job done. At Mudscupper's, we encourage everyone to see for themselves. Google "Manuka Oil and MRSA, or Staph", Then Google the active ingredients in other products. We only use the best ingredients from around the world and formulate them with East Cape Manuka Oil. This oil is an extremely effective antibacterial, anti-inflammatory, anti-fungal, antimicrobial with microbe damage reversing benefits. It is scientifically proven effective against Pathogenic Fungi, harmful gram negative and gram positive bacteria, to include: Streptococcus (Strep), Staphylococcus aureus (Staph), Methicillin-resistant Staphylococcus aureus (MRSA). 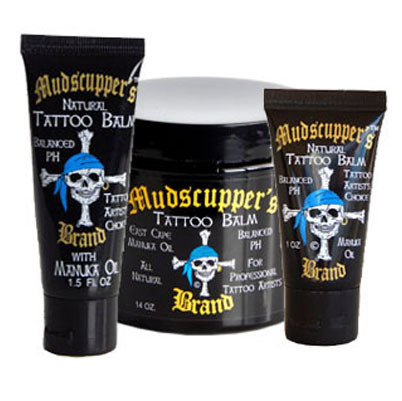 Mudscupper's All Natural Tattoo Balm is an excellent first aid product. It is 100% natural and provides: deep penetration, longer moisturizing, healthy healing and most important, protection against infection. Afterall, isn't this what customers really want? Our tattoo balm is so effective for traumatized skin, people purchase it as a multipurpose first aid for cuts, scratches, burns, insect bites, rashes, etc., and for treating psoriasis, eczema and other skin diseases. Something you just don't hear about with other tattoo/first aid products. 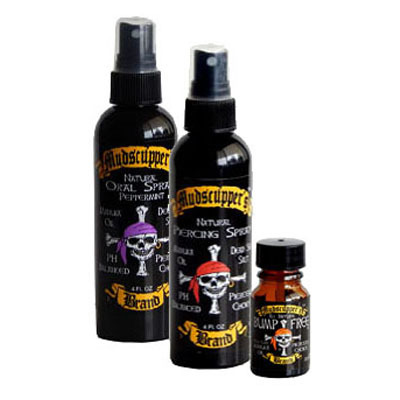 Mudscupper's Natural Piercing Spray and Oral Spray provide superior healing and protection. Our piercing spray is pH balanced, cleanses piercing, helps promote faster healing, prevents piercing bumps and infused with the infection preventing benefits of *East Cape Manuka Oil. Our piercing spray is first aid for all body modifications and minor injuries, to include: cuts, scratches, burns, insect bites, rashes, oily skin and acne. Our oral spray is formulated with the most beneficial ingredients throughout the oral hygiene industry; pure Peppermint, Menthol and Xylitol. This oral spray helps provide a neutral pH to prevent bacterial growth that causes gum disease, infection and bad breath. We guarantee our piercing products will provide more health benefits and outperform other leading brands. PRODUCT CHALLENGE: Google "Manuka Oil and MRSA", then search the active ingredients in other products and MRSA. You'll discover why Mudscupper's brand products are the absolutely the best when it comes to your health and protection. Disclaimer: These statements have not been evaluated by the Food and Drug Administration. These products are not intended to diagnose, treat or prevent disease.. Copyright © 2013 Mudscupper's Inc.. All Rights Reserved. Built with Volusion.